An ISO file, often called an ISO image file, is a single file that’s a perfect representation of an entire CD, DVD, or Blu-ray. The entire contents of a disc can be precisely duplicated in a single ISO file. The Matroska Multimedia Container is an open standard free container format, a file format that can hold an unlimited number of video, audio, picture, or subtitle tracks in one file. It is intended to serve as a universal format for storing common multimedia content, like movies or TV shows. Matroska is similar in concept to other containers like AVI, MP4, or Advanced Systems Format (ASF), but is entirely open in specification, with implementations consisting mostly of open source software. Matroska file extensions are .MKV for video (with subtitles and audio), .MK3D for stereoscopic video, .MKA for audio-only files, and .MKS for subtitles only. If you have ripped your DVD movies to ISO files or have some DVD ISO image files downloaded from the Internet and now want to convert ISO to MKV videos so that you can easily share the movies or play the movies on some media players, then you are definitely in the right place here! In this article, you are going to learn how to rip ISO to MKV videos with fast ripping speed and lossless video quality. 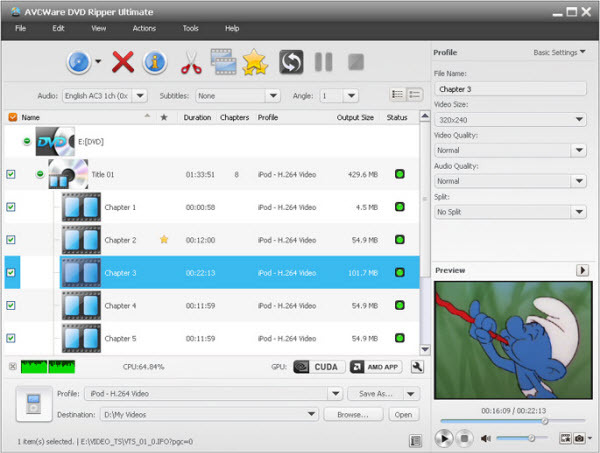 To accomplish the task, what you need is an intuitive tool that can convert DVD ISO files to MKV videos. Haven’t got a clue? Here Avcware DVD ripping software is highly recommended to help you do that ISO to MKV conversion. Apart from MKV, it can also convert ISO/DVD/IFO to almost all regular video formats, including MP4, AVI, ASF, MOV, M4V, MKV, WMV, DV, VOB, MPG, TS, TRP, DPG, 3GP, 3G2, FLV, F4V, SWF, etc. If you are a Mac user, please turn to Mac DVD ripper, which has the same functions as the Windows (Windows 10 compatible) version. Now don’t hesitate to try the program and check out the guide below on how to convert ISO image files to MKV videos step by step. After downloading, install and run the DVD Ripper, then click “Load DVD” > “Load ISO files” to load the ISO image files you want to rip. As you can see, DVD disc, DVD folder, IFO files are also supported. Choose “MKV” as the output format from “Profile” > “Common Video” as the output format. If you’d like to generate HD MKV videos, you can select ” HD Video” > “MKV”. Then you can click “Setting…” to tweak the detailed video and audio encoding settings. In the end, go back to the primary window and click “Convert” to begin converting your ISO files to MKV files. When the conversion completes, click “Open” to get the ripped MKV video files, then play and share them anywhere you like! Blu-ray ISO file can only be played with virtual driver software or the similar tools, and you can’t play ISO on most popular media devices or share on website directly. However, after converting it to other video format like MKV, you can play it anywhere you want. This article will offer you an easy way to convert Blu-ray ISO to MKV video. If you have ripped your Blu-ray movies to ISO files or have some Blu-ray ISO image files downloaded from the Internet, just follow the guide to learn how to rip Blu-ray ISO to MKV with fast ripping speed and lossless video quality. To convert Blu-ray ISO image files to MKV, you can use Avcware Blu-ray Ripper, which can help you rip your Blu-ray ISO files to MKV, and allows you to manually adjust encoding settings to customize the output video quality and file size. In addition, if you want to edit videos, adjust subtitle, select audio track, add text or image watermark to videos, all these can be easily achieved with this powerful tool. The equivalent Mac Blu-ray ISO converter is Blu-ray Ripping software for Mac. Just get the right version of the Blu-ray Ripper and follow the guide below to convert ISO image files to MKV videos for better playing and sharing in only three steps. Launch the Blu ray ISO converter; click Add button to import Blu-ray ISO movies into the program. Click Format bar and select “MKV(Matroska) Video (*.mkv)” as output format from “Common Video” category. If you want to get better HD video quality, just select “MKV HD Video (*.mkv)” from “HD Video” category. Tap “Convert” button on the main interface to start transcoding Blu-ray ISO movies to MKV. After the conversion, click “Open” to locate the result videos and then you can play the Blu-ray ISO files on your PC or digital players smoothly.